I have written about Hamed Rouhinejad before, the Iranian student of philosophy who is sentenced to 10 years imprisonment and suffers from the debilitating MS disease. Hamed's crippling MS has not made the Islamic Republic judiciary and prison authorities any more lenient or merciful. In fact they seem to enjoy maximising this poor young man's suffering. 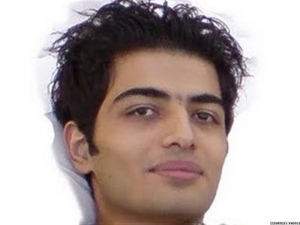 Iran's prison authorities and judiciary not only have denied him his medication, they transferred him to the remote prison in Zanjan too. These sadistic bullies seem to enjoy watching a young man being tormented to a slow death. Hamed has now lost 50% of his visual and hearing senses and day by day more parts of his body is paralysed. To be a strong healthy man in Islamic Republic's prisons is hell, to endure these dungeons while incapacitated with a terrible disease like MS is beyond any imagination. Despite the long journey from Tehran to Zanjan, Hamed's family have made every effort to visit him so that their son is not alone as he suffers this gruesome slow death. You would have thought even the cruelest, the most sadistic and heartless fiends would not prevent a young man in such conditions from having the one luxury of a family visit every now and then, yet after having made the long journey to see their son last week, Hamed's family were told they were not allowed to see him and his visiting privileges have been stopped until further notice. How utterly inhumane is that? Those Iranian expats who attend the regime's dinners, should think about the Hameds in Iran before scuffing their iniquitous morsels. This regime is produced by western countries to exploit Iran. If they remove their support from this regime , it wo`nt last a month! The Iranian regime is a sadistic, crazy and criminal entity.